The two biblical scenes most commonly depicted in art come from the New Testament, from the Gospels of St Matthew and St Luke. They are The Nativity of Jesus (Matthew 1:18-25 and Luke 2: 1-7) and The Adoration of the Magi (Matthew 2:1-12). Although the Bible only speaks of magi, or wise men, who present Christ with gold, frankincense and myrrh, Christian literature and art transformed these into three kings, one of whom was subsequently represented as a Black African or Arab (Moor). Maarten de Vos, Aanbidding van de drie koningen, 1599. Musée des Beaux-Arts de Valenciennes. The Black King stands prominently to the fore in this imposing painting by Maarten de Vos. The dark armor he wears makes him appear almost naked beneath his white mantle. He far surpasses the other two Kings in strength and vitality. 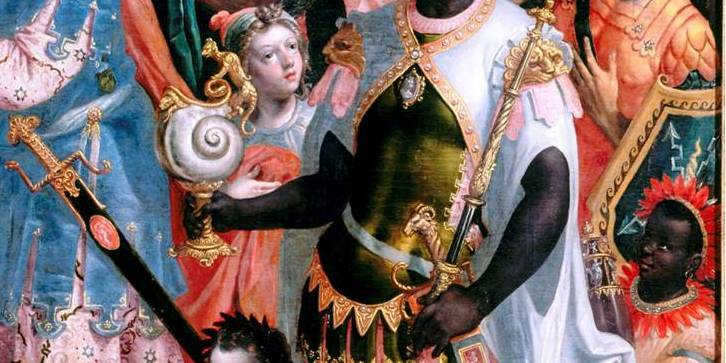 The Black King is also depicted in the attire worn by powerful men, a Roman emperor’s garb. 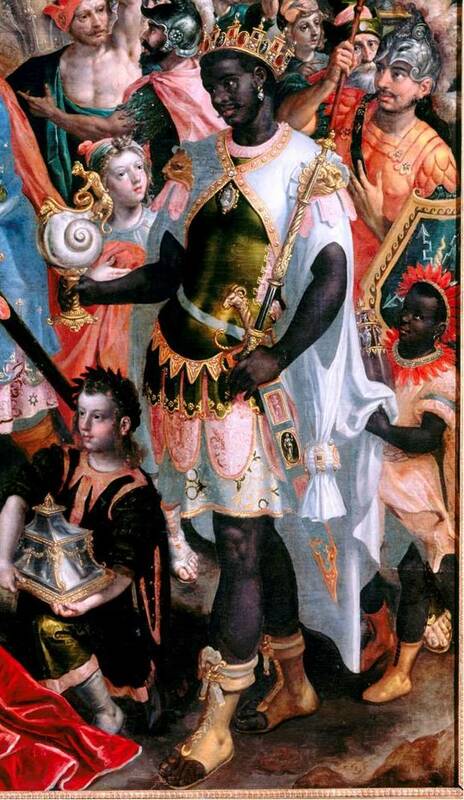 Representations of black men as Roman emperors are not unusual in Dutch and European art: they are found, for example, on a number of cameos from the sixteenth century. 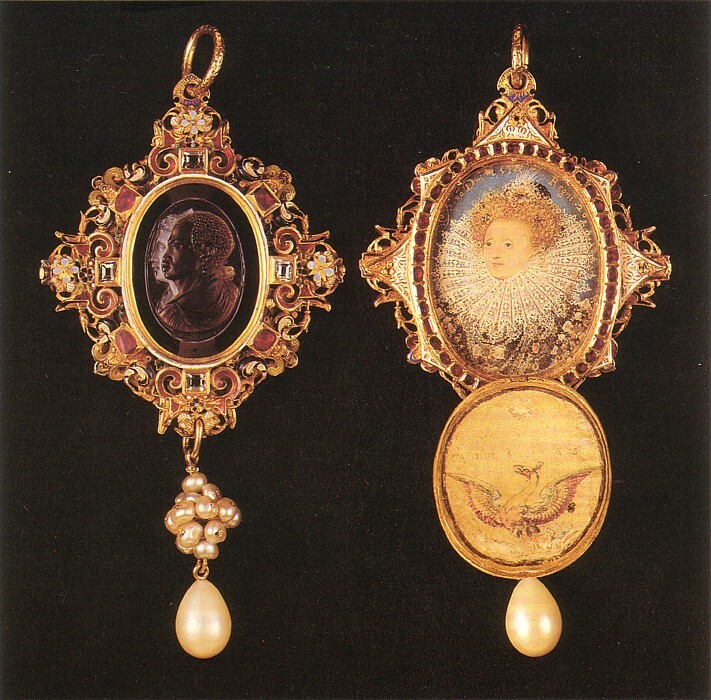 In circa 1586/88 Queen Elizabeth I of England gave her favourite Sir Francis Drake a jewel decorated with a black Roman emperor and a white woman. Karen C.C. Dalton argues that the concept of the black emperor is connected with alchemy and stands for Saturn. Professor Elizabeth McGrath, however, suspects that such black emperors symbolize steadfastness and constancy. The aspect of constancy may also play a role in De Vos’ painting which was produced in a period of religious and political instability. When the Catholics restored their altars in the wake of the Iconoclastic Fury, in 1566, they included paintings of the Three Kings in the decorations, so it is not inconceivable that they would have alluded to the constancy of their faith in these works. An interesting detail is the gift which the Black Magus holds in his hand, which appears to be a nautilus shell but is actually the much rarer Green Turban or Turbo Marmoratus, also spiral-shaped but less regular in form, with a thicker shell. It was chiefly popular for the large amount of mother-of-pearl it contained. Once polishing had removed the rough outer surface to reveal the mother-of pearl, the shell was mounted on its side with the spiroid top on display. This type of showy shell cup first appeared around 1590 and was probably of Antwerp design. An earlier print by Johannes de Sadeler from 1585 of the same subject after another De Vos shows even more clearly that the Ethiopian King is holding a Green Turban. In the painting by De Vos the Three Kings have not arrived by themselves. Standing immediately around them are twelve other people; in the distance a heavily laden and armed caravan with camels and elephants is also approaching. This painting is one of many Antwerp Adorations which typically show costly goods being brought from far and wide. Around 1599 Maarten de Vos was one of the most important Flemish painters and print designers. He received many commissions, including assignments from the city of Valenciennes, which remained part of the Netherlands until 1680. The painting was ordered by the parishioners of Notre-Dame de la Chaussee, to decorate the high altar. With thanks to Errol van de Werdt (Centraal Museum Utrecht) for his help with the Turbo Marmoratus, and Professor Elizabeth McGrath for her help with the Black Romans in Art. All photos on this site are not intended for any commercial purpose. I have tried to trace all the rules and rights of all images. As far as I know, these images can be used in this way. If you ar a copyright holder and would like a piece of your work removed or the creditline changed then please do not hesitate to contact me. In works of art the kings could function as more than one symbol. They could represent the regions of the world, the ages of man, ambassadors of peace, wealth from faraway, foreign countries, trade with these countries and more.